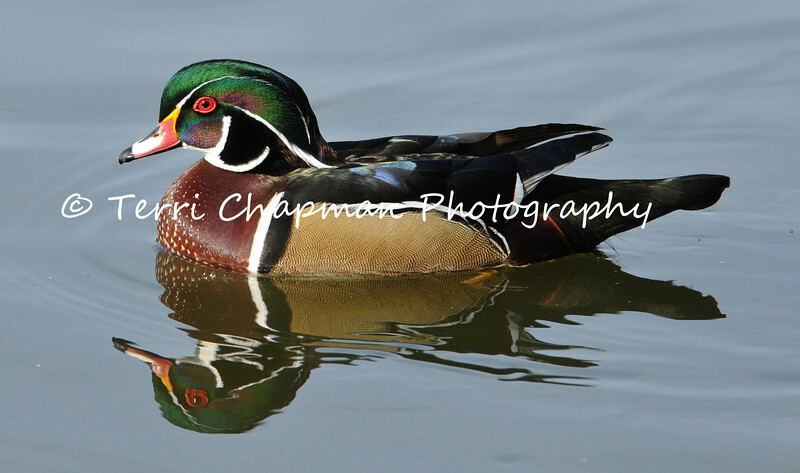 This image is of a a male Wood Duck. The Wood Duck is one of the most stunningly beautiful of all waterfowl. Males are iridescent chestnut and green, with ornate patterns on nearly every feather; the elegant females have a distinctive profile and delicate white pattern around the eye. These birds live in wooded swamps, where they nest in holes in trees or in nest boxes put up around lake margins. Unlike most waterfowl, Wood Ducks are equipped with strong claws that can grip bark and perch on branches and nest in trees and are comfortable flying through woods. Their broad tail and short, broad wings help make them maneuverable. When swimming, the head jerks back and forth much as a walking pigeon's does. You often see Wood Ducks in small groups (fewer than 20), keeping apart from other waterfowl.